How should you select a dry cleaner? Choosing a dry cleaner can be a difficult task when it comes to handing over some of your favorite items. Check out the info below when deciding who to choose. We have given you our answers and the reasons to choose us. What is their lost garment/damage to clothing policy?Do they replace or give you depreciated value as listed in the International Fabricare Institute’s Fair Claims Guide? What this means is that a three year old custom suit bought for 2K can be argued by a cleaner to only be worth 200 dollars. So, was saving that $5 worth it? Always choose a cleaner with a great replacement policy. -Our policy on lost or damaged items is to take every situation on its own and work through it work the customer to come to a fair settlement on both sides. We will do what is right to maintain the strong relationships we build with our customers. Are they clear on their pricing?Do they try the old “bait and switch” trick, and if so, what does this say about the integrity of the cleaner? Make sure to ask how much you’ll be charged upon picking up your item – the lowest price guarantee that brought you into the store may only apply to one item, and even the listed prices may just be starting prices not including extra costs applied to specialty garments. -We charge based on each item. Most of our pricing does not incur any upcharges or additional fees. The price we tell you is the price you will pay. On occasion, there will be an additional charge for excess hair removal or heavy stains that take more time to work on but we will be up front about these charges. How long have they been in business under their current name?Be wary of a cleaner that has changed ownership and names every few years. In the case you do have an issue with a cleaner, take them to court, and win, collecting on a judgment is notoriously difficult because unless they voluntarily pay up, you need to force a withdrawal. -Paris Cleaners has been in business since 1903 in the Kalamazoo and Portage areas. We are invested in the community and looking to continue to grow. What level of training do they have?When you hand the person behind the counter a silk shirt and ask for it to be laundered, you want someone behind the counter to suggest that the shirt be carefully dry cleaned instead, since a harsh washing method like laundering would destroy the shirt. Don’t be afraid to ask about trainings and “test” their knowledge of the cleaning process. -All our employees go through rigorous training to learn all about the process of cleaning and the care each type of fabric needs. We have employees who have been working in the industry for over 20 years and are the best around. Are they environmentally friendly? Repeated exposure to large amounts of perc can cause cancer in humans.I am very pleased to see professionals in the industry moving to a chemical free cleaning process that involves CO2. In addition to being friendly to the environment, it is a superior cleaner to petrochemicals. -We moved away from harmful chemicals years ago as a result of the damage they cause to the environment. We offer 3 different cleaning solvents that are all safe for the environment. We also have recycling programs in place for the hangers we use and the poly bags that are placed over the clothes. We welcome our customers to send them all back to us. Moths are the kind of pests most of us have just learned to live with. They always seem to be around and don’t really bother you – until you pull out a silk blouse or Great Grandma’s linens that have been passed down from generation to generation. Moths can seem quite innocent in nature, but their destruction of wardrobes, fabrics and textiles can be pretty tragic, especially when it happens to family heirlooms! What if I were to tell you that you can prevent moths and not have to live with them and their destruction ever again? Wash before storing. You will need to wash your cloth items before you put them away. 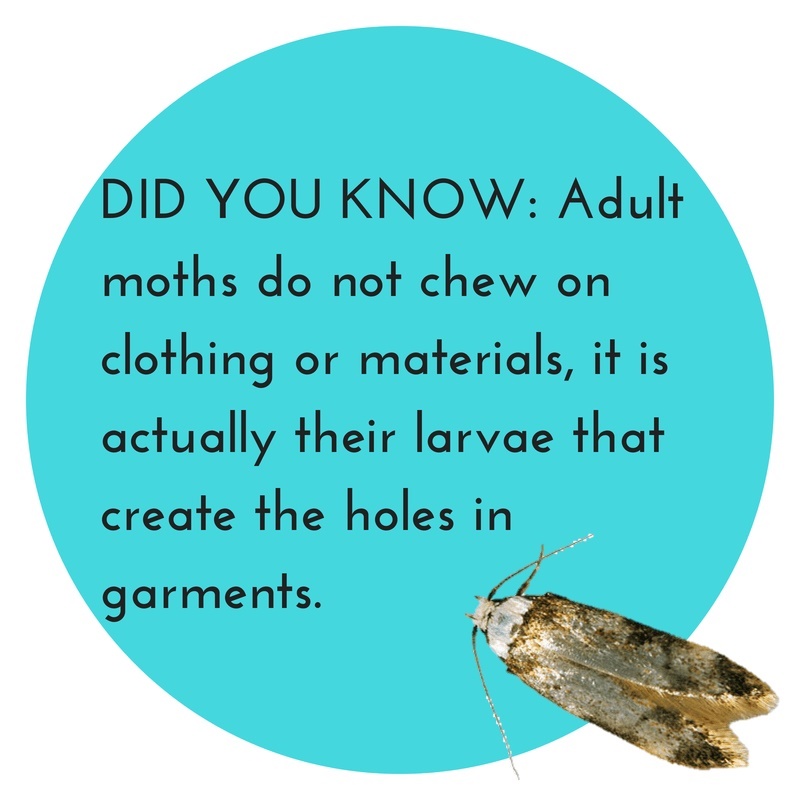 Moths are attracted to soiled clothes containing sweat, hair, body oils or dead skin cells. Washing or dry cleaning clothes first will make them less attractive to moths. Clean storage area. It is important to clean off the shelf, closet, chest or whatever type of area where you will be storing your items. Pre-cleaning the area will assure that any moth larvae or existing moths will not already be present to cause damage. Store in vacuum sealed bags or airtight containers. You want to make sure that moths will not, and cannot, get into your items. Cardboard boxes or flimsy plastic bags such as garbage bags or used shopping bags will not provide enough protection from pests. Place a natural moth repellent in stored items. By doing this, you are placing the final touch assuring that you will not get moths or moth larvae in your items. Stay Away® Moths creates an invisible barrier that keeps moths out and protects your clothing, linens, family heirlooms and other fabrics. No matter what you are storing or where you store it, you will be satisfied knowing that your things will not be destroyed by moths. Don’t let these pesky critters cause damage to your clothing and fabric items. Seasonal changes are a great time to get your items professionally cleaned before you put them away. Visit any of our 6 locations to make sure the items are cleaned properly. Have a summer vacation trip planned soon? Summer is an exciting time to get away and relax. Unfortunately, traveling can be very hard on your clothes. It is important to keep these tips in mind to make sure you always look your best during this vacation season! Before leaving town, be sure to visit Paris Cleaners to make sure that your clothes are in great shape for your trip. It’s one of the worst feelings in the world to unpack your favorite shirt, blouse or dress, and put it on only to realize that there is a stain on it. The best items to pack are light fabrics. Not only will these keep you cool on your sunny, summer vacation, but they will make it easier to carry your luggage while traveling! The lightest fabrics also tend to be the most delicate, so dry cleaning may be necessary once you return from your trip. Take care when you are packing your clothes in a suitcase. After picking them up from the dry cleaner your clothes will be in the best condition possible, and you don’t want to ruin that by packing them awkwardly. This will create wrinkles, and could even cause delicate threads or fabrics to get caught in a zipper or clasp, possibly damaging them permanently. As soon as you reach your destination unpack your clothes. Hang them in the closet to avoid wrinkles and make sure they have a chance to breathe so they keep their integrity. If you are staying at a hotel or other unfamiliar setting, be sure to unpack your clothes on a table. Packing and unpacking on the surface of the bed could expose your clothing to nasty bedbugs, which are becoming a more prominent problem when traveling. Dry cleaning can remove bedbug infestation, but it is a problem you want to avoid when possible. When you return, take your clothes and laundry straight to the dry cleaner! Your exciting adventures have probably led to some wear to your clothing, and dry cleaning will help restore them so they will be ready for your next expedition! You will also have mounds of laundry to complete. Let us help with our wash & fold service! This can relieve some of the anxiety of returning home and catching up. Visit any of our 6 area locations or try our FREE pick-up and delivery service before or after your trip. Too much Laundry but not enough time? (LG electronics commissioned appliance behavior survey of 1,003 Americans). Have you noticed holes, torn fabric or other damage on your garments after taking them out of the washing machine? This could be the result of overloading your unit. When washing machines are run beyond their manufacturer recommended load capacity, zippers, buttons and other embellished accessories can latch on to nearby garments, causing permanent damage to the fabric. You might be surprised to learn that overloading a washing machine can result in garments not being properly cleaned. When the garments are soaked in the initial cycle, they turn into one large mass that restricts the normal circulation of detergent. The detergent remains trapped on the top (or wherever you poured it) and is unable to circulate throughout the large mass of clothes. 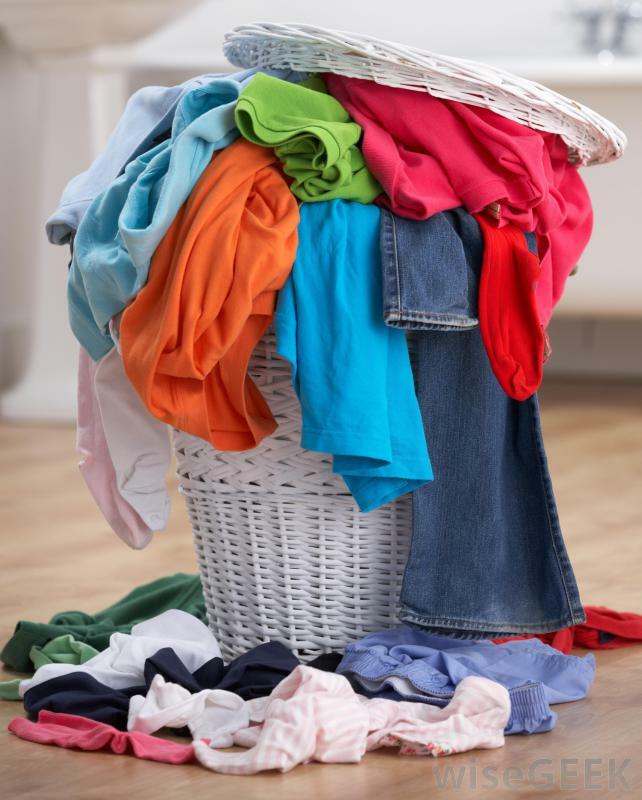 Whether you use liquid or powdered detergent, it needs space to move around; otherwise, it will remain clumped up where it’s unable to access all of the garments. It’s not uncommon for socks, underwear or other small garments to get sucked down inside the washing machine’s drainage line, preventing the water from draining. You can reduce the risk of this occurring by only loading the unit to its recommended capacity. Overloading a washing machine can also damage its components. A couple extra garments may not seem problematic, but those garments carry a significant amount of weight when wet. Among other things, this additional weight can strain the motor to the point where it blows. If you find yourself in this situation, let our team at Paris Cleaners & Laundry help. We weigh each load to ensure maximum cleaning and tumbling action within our machines with the correct ratio of soap and water for your clothing. Not only is it washed and dried, it comes back professionally folded and ready to be put in your drawer. Reduce unnecessary wear on your machine and give yourself more time to spend doing the things you enjoy. our Wash & Fold program. cause swelling the fibers that lead to damage and discoloration. cleaner can re-shape the garment, restore creases and eliminate wrinkles through steam pressing. Some of the above issues such as ingrained grime can be prevented with regular dry cleaning. weakened fibers that existed before cleaning. with our free pick-up and delivery service. Coat season has arrived so it’s time to pull them out and stay warm. 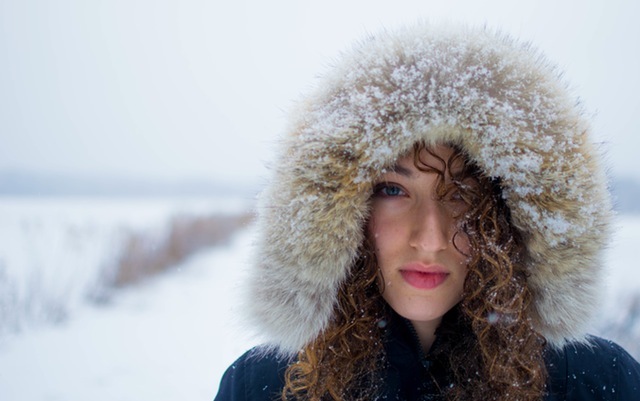 If your coat doesn’t look quite right, Paris Cleaners & Laundry dry cleaning services are here to help! 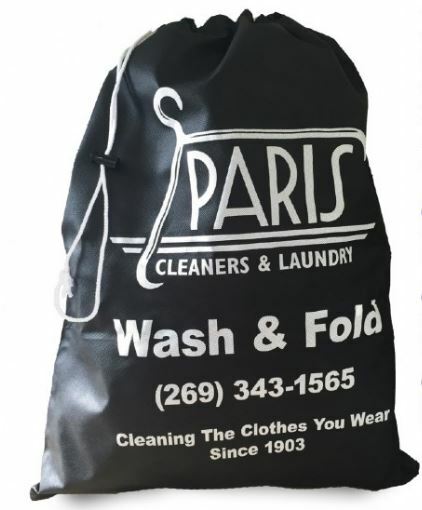 To take advantage of convenient laundry and dry cleaning pick-up services near you offered by Paris Cleaners & Laundry, call 269-343-1565.